Foton closes out its campaign with a victory after five straight losses. BINAN — Foton Pilipinas snapped its skid on the final day of competition in the 2016 AVC Asian Women's Club Championship, salvaging seventh place with a four-set win over T. Grand of Chinese Taipei on Sunday at Alonte Sports Arena. American import Lindsay Stalzer scored 18 points, all from kills, as the Tornadoes ended a five-match losing run, finishing the tournament on a winning note, with a 25-17, 30-28, 25-23 victory that sent T. Grand to eighth spot. Ariel Usher scored 15 points, Aby Maraño chipped in 11 and Jovelyn Gonzaga added 10 for Foton Pilipinas. The Super Liga squad finishes seventh in a 12-team tournament after Petron last year wound up eighth in a nine-team field in Vietnam. "Maganda ang ipinakita ng bawat isa sa amin," said skipper Jaja Santiago. 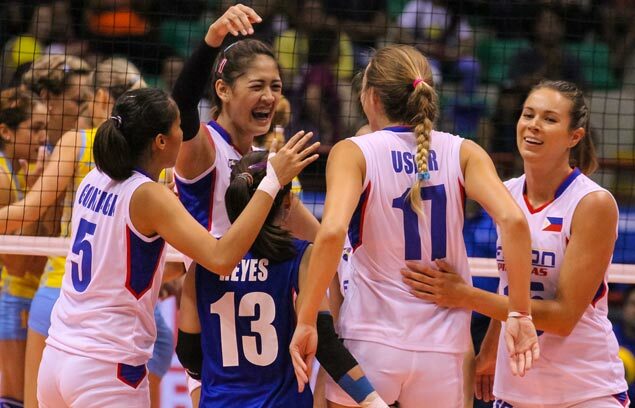 Italian coach Fabio Menta, however, believes Foton Pilipinas players lacked the killer instinct. After a dominating first set, the Tornadoes saw themselves trailing, 14-18, before countering with a 7-3 run capped by a Maraño kill to even the contest, 21-21. "Probably the fire wasn't there, that's my reading of the game," he said. Foton Pilipinas started the tournament with a win over Kwai Tsing of Hong Kong, lost five straight, before ending the stint with vicgtory over the Chinese Taipei squad. T. Grand threatened in the third set, 23-22, but Foton Pilipinas sealed the win with three straight points, the last on a Gonzaga attack. “The Philippine team is much taller than us. After the first set we tried to adjust in the second and third but the Philippines is really a good team,” said T. Grand coach Lo Chung Jen. “We are a young team and we came here to get experience,” he added. Team captain Chiu Ya Hui scored 13 points for Chinese Taipei.